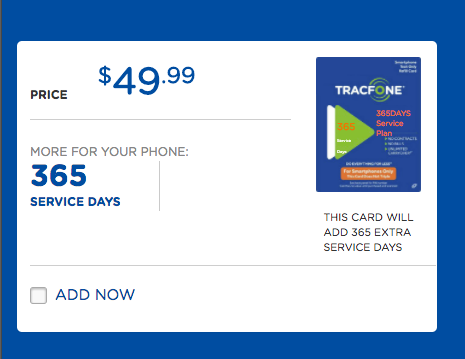 Did you know you can add 365 service days to your tracfone account? Well you can. Any time you minutes online, Tracfone offers you the option to add 1 year of service days for $49.99. As far as I can tell from looking on tracfone.com is that the only offer this option when you add a refill card. But this does make for some interesting options. Many long time Tracfone customers are carrying over 1000s roll over minutes, texts, and MBs of data. You can keep your minutes as long as your account is active so many people keep buying more minutes each year. But if you buy the least expensive service plan, say a $15 30 smartphone plan you can keep you service active for another year for $65. Not a bad deal as this could lower your overall yearly cost. Buying a $15 smartphone plan and adding the $50 year of service is a an inexpensive way to keep your phone active. For $65, you have an active phone number with 200 minutes of talk, 500 text messages, and 200MB of data. While that is not a lot of service, you’ll be able to add 1GB of data for $10 and 1000 text messages for $5. That data and those text messages will rollover indefinitely as long as your account is active. If you don’t spend much time on the phone, this could be a nice plan especially since you can add data as needed. Same as the others, we have a ton of minutes, texts, and data left but just needed another year of service. Thanks for this excellent tip where I just purchased the 1,000 texts and got a service add-on option. I then deleted the 1,000 texts from the cart and got my service extended for another year for $50 plus state tax. This worked great! I chose $5.00 text only minutes, was offered 365 days for $49.99 and was able to use a tracfone promo code for additional 1000 text when purchasing $5.00 text. So – 2000 text plus 365 days for $58.89. Thanks so much! That’s great. for many of us using bring your own smartphones, they recently removed this option. Glad to hear it was still available for you. Tracfone has made it impossible to get this offer, I have tried over and over again to get it, TracFone Chat says I can add the service days only for $49.99 by calling Customer service. Customer service says it is NOT available. First you have to buy a card with minutes, which I did, That makes me eligible to add on service days for $49.99 without paying for extra minutes that I do NOT need. Tracfone has some business practices that I feel are deceptive. I’m sorry I stuck with this company. I’ve been a regular customer for over 15 years! So disappointed!! Tracfone get your act together!!!!! If you really want it, check out your local retail store that sells tracfone refill cards. If you can buy one in the store, you should still be able to add it to your account. I’ll have to look into this. While I’d be disappointed if they discontinued the one year add-on, they have every right to do so. That said, the online chat and phone support team should be able to just clearly tell you its no longer available. Thanks for the tip Amy. I’ll try this out. Does this work for smart phone plans? It is exactly what I need, but I do not see any options for “add service days only” at check out. 🙁 Please advise! Yes. it works. when I add a $15 plan to my cart the 365 Extra Service Days $49.99 option is under MORE FOR YOUR PHONE. If you don’t need the service plan, you can then remove it from the cart after adding the service days. As you say, I only found this offer as an option at checkout when I went to add a refill card. I also found that I could cancel the purchase of the refill card during checkout and still buy the 365 day service plan for $50; a good deal for me since I have rolled over more air time than I ever purchased on a single card and over 1.2 GB of data. Cool, nice find. Thanks for sharing that. thanks for posting!! just bought sim and plan and will add as soon as I set up my phone!! happy to hear that the year service plan is still being offered! !